The Securities and Exchange Board of India (Sebi) late on Wednesday banned Price Waterhouse (PW) from providing audit services to listed companies and market intermediaries for two years in the Satyam fraud case. Two PW partners have been banned for three years. The regulator also imposed a disgorgement of Rs 130.9 million on Price Waterhouse, and two of its chartered accountants - S Gopalakrishnan and Srinivas Talluri. The three entities also have to pay 12 per cent interest on the disgorgement amount since January 7, 2009, in 45 days from the date of the order. These entities have been charged under Sebi’s prohibition of Fraudulent and Unfair Trade Practices (FUTP) regulation. “I find that the auditors have failed in showing any evidence to the effect that they had done their job with standards of professional duty and care as required. "The auditors were well aware of the consequences of their omissions which would make such accumulated and aggregated acts of gross negligence scale up to an act of commission of fraud for the purposes of the Sebi Act and the Sebi (FUTP) regulation,” said G Mahalingam, wholetime member, Sebi, in a 108-page order. 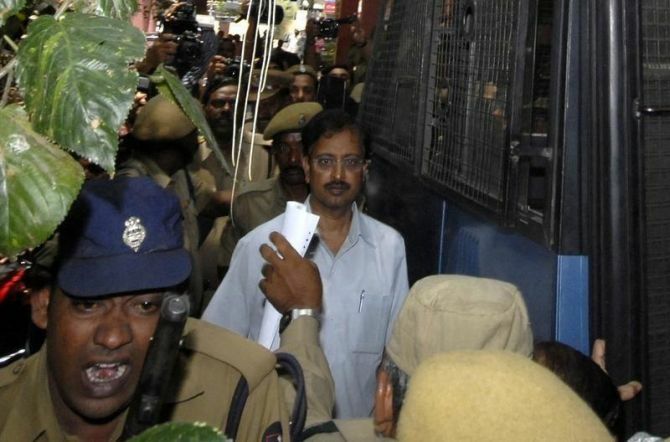 The case dates back to 2009, when chairman of Satyam Computer Services (Satyam) B Ramalinga Raju admitted and confessed to large scale financial manipulations in Satyam’s book of accounts to the tune of Rs 50.4 billion. Soon after this, Sebi initiated investigation and later on issued showcause notices to PW and its associates in February 2009. Further notices were issued to PW in 2012 under FUTP regulations. Sebi, which has been probing PW for nearly a decade, and was asked by the Supreme Court in January 2017 to expedite the matter, held a series of hearings with the auditing major and its officials during May-June this year. The Supreme Court had directed Sebi to complete in six months its enquiry proceedings against PW. “A dispassionate analysis of the whole episode spanning over a period of at least eight years would reveal that the perpetration of the fraud could not have been made possible without the knowledge and involvement of the statutory auditors of PW,” Sebi noted. “In my assessment, the circumstances point towards gross negligence and fraudulent misrepresentation. I note that the auditors made material representations in the certifications without any supporting document. "The acts of the auditor induced the public to trade consistently in the shares of the company,” explained Mahalingam. Sebi noted that the impact of the fraud was such that as soon as the scam unfolded, the price of the scrip dipped to a low of Rs 41.05 on January 7, 2009, from Rs 178.95 on the previous day’s price on NSE. “This shows that the acts of the auditor resulted in loss to the investors of the company,” said Sebi. According to Sebi, the objective of insulating the securities market from such fraudulent accounting practices perpetrated by an international firm of repute will be ineffective if the directions do not bring within its sweep, the brand name PW. “The network structure of operations adopted by the international accounting firm should not be used as a shield to avoid legal implications arising out of the certifications issued under the brand name of the network,” the order said. Pursuant to Sebi’s showcause notice, Price Waterhouse had moved the Bombay high court, saying that Sebi being a stock market regulator has no jurisdiction to issue showcause notice to auditors’ firm. Only a body such as Institute of Chartered Accountants of India can do this, it contended. On the other hand, Sebi had said that auditors have “direct, fiduciary” relationship with shareholders and they had incurred losses due to decisions based on Satyam’s balance sheet. Later, the Bombay high court ruled that Sebi had the powers to issue showcause notice to PW. Later, PW had approached the Securities Appellate Tribunal (SAT) on the issue of cross-examination, following which the Tribunal last month asked the regulator to allow cross-examination of some more persons. Besides, they were asked to pay close to Rs 15 billion as interest on the disgorgement amount, as the penalty was levied with effect from January 7, 2009 - the day Raju admitted to a massive long-running fraud at the firm. After hearing appeal against these orders, the SAT in May 2017 directed Sebi to pass a fresh order with respect to the quantum of punishment given to Raju and four others. In a late night statement, PW said it was disappointed with the order. “The Sebi order relates to a fraud that took place nearly a decade ago in which we played no part and had no knowledge of. "As we have said since 2009, there has been no intentional wrong doing by PW firms in the unprecedented management perpetrated fraud at Satyam, nor have we seen any material evidence to the contrary. "We believe that the order is also not in line with the directions of the Bombay high court order of 2010 and so we are confident of getting a stay before this order becomes effective”. PW said it had learnt the lessons of Satyam and “invested heavily over the last nine years in building a robust and high quality audit practice, as also confirmed in 2015 by an independent monitor appointed by the US SEC and PCAOB.